Having ended Chelsea’s surge to the top of the Premier League table certain conclusions could have been drawn from Tottenham Hotspur’s win over Antonio Conte’s title favourites two weeks ago. That would have been a little too knee-jerk, though. Instead it was the weekend just passed that provided the evidence to make a judgment on Spurs’ prospects this season. In isolation a 4-0 home win over West Brom wasn’t especially remarkable, but with everything else factored in it was the weekend they became Chelsea’s primary challengers. Mauricio Pochettino’s side are currently on a six-match winning run in the Premier League (seven-match winning run in all competitions) and have yet to concede a league goal in 2017, collecting three successive clean sheets. Spurs have found their groove in recent weeks, but it’s not their own results alone that have propelled them into contention at the top of the table. Coupled with Liverpool’s slump in form, Spurs’ surge has coincided with them moving into second place in the Premier League standings. It may well be the case that they have been challengers for quite some time, even before their landmark win over Chelsea, but now they have the league position to point to as proof. Their rise up the table shouldn’t come as a surprise. In fact, it could be argued that Spurs have up until now underperformed. That given their quality they should have positioned themselves as title challengers much earlier in the season. The 4-0 win over West Brom on Saturday was just another illustration of that quality. Under Pochettino Spurs have forged the best centre-back pairing in England in front of one of the best goalkeepers in England. Jan Vertonghen may be missing for a month or two but in Kevin Wimmer and Ben Davies, Spurs have two ready-made, left-footed defenders who won’t upset the team’s balance to play three at the back. Those centre-backs are flanked by the best full-back duo in England, with the duo of Moussa Dembele and Victor Wanyama potentially the strongest – certainly the most formidable – midfield platform in England. Then there’s Dele Alli, the brightest young talent in England, who has scored seven times in his last six outings. Ahead of him, Harry Kane has proven himself as far more than a two-season wonder, netting 13 goals in just 16 games this season. He is truly (you get where this is going) one of the best centre forwards in England. Given all this individual quality, Spurs’ place near the top end of the Premier League is perhaps expected, but Pochettino has brought this all together to result in something far greater than the sum of their parts. Quite an impressive achievement considering that the parts are rather valuable on their own. Spurs have become the Premier League’s most team unit over the past two seasons, doing what so few seem able to manage in the English game – build something. They established a platform last season, even if they dipped towards the end of the campaign. It has taken them some time to get up to speed, but Spurs have now added to that foundation. For all their on-the-field talents, Pochettino is Spurs’ greatest asset. He’s not just the one who holds everything together, but the one who guides and directs everything about Tottenham as a club. He has become the most influential figure in Spurs’ recent history, controlling the club in a way only Arsene Wenger does at current Premier League level. Of course, Pochettino still has some work to do in making Spurs less ‘Spursy,’ strengthening their resolve as a side and ensuring they possess the mentality to last the course in a title race. But the Argentine has shown himself and his players to be learners. They tend not to make the same mistake twice. Look at how they beat Chelsea after suffering a defeat at Stamford Bridge that ended their title hopes last season. 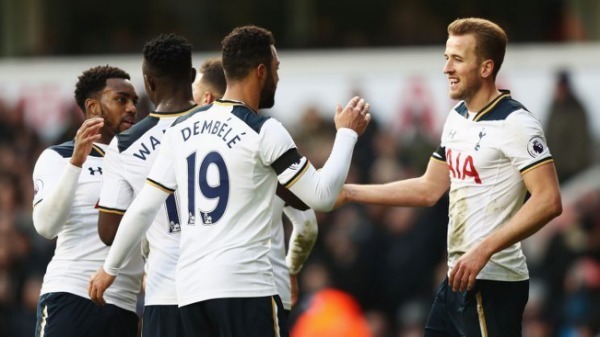 Spurs are ready to challenge for real, and last weekend was the moment that became apparent.